Signatech-Alpine today took the wraps off its two Alpine A460s at Le Castellet, France. The name of the new prototype continues the series which began with the A440 in the 1970s and which echoes Alpine’s 60th anniversary celebrations of 2015. With new LM P2 regulations due to come into force in 2017, the Alpine A460 features a new FIA-homologated chassis. Compared with its predecessor, it has a closed cockpit for enhanced driver safety and aerodynamic efficiency. It is the first closed-cockpit Alpine since the A220 of 1969. The Alpine A460 is powered by the same 4.5-litre V8 as the A450b. This Renault-Nissan Alliance engine delivers more than 550 horsepower and drives through a six-speed sequential gearbox. 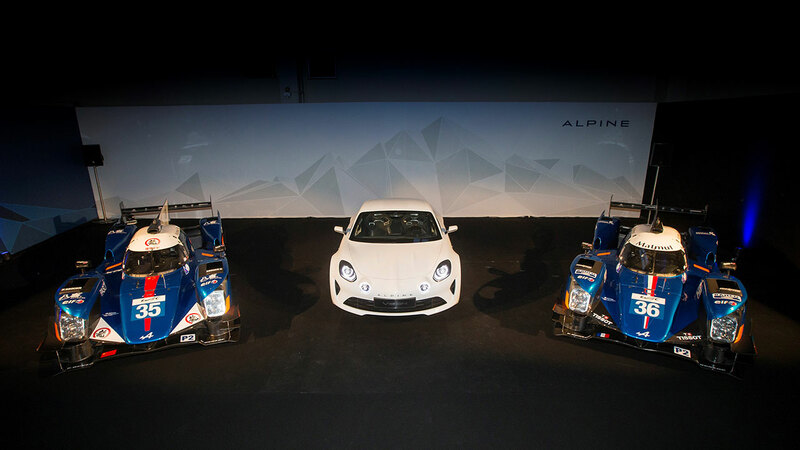 The two Alpine A460s were unveiled alongside the Alpine Vision and Alpine Célébration show cars and sport a blue and orange livery, the colours chosen by Alpine since its motor racing comeback in 2013. The cars will be distinguishable by national flags: French for the N°36 prototype, and Chinese for the N°35 prototype. The latter (entered under the name of Baxi DC Racing Alpine) will be in the hands of Frenchman Nelson Panciatici – a cornerstone of the team since the programme’s early days in 2013 – and Chinese drivers David Cheng and Ho-Pin Tung. Formed by SR-Jackie Chan and David Cheng, DC Racing won several Asian Le Mans Series titles before joining forces for the 2016 FIA WEC campaign with Signatech-Alpine who will run the programme’s technical, sporting and logistical sides. The N°36 car – the number which claimed back-to-back ELMS crowns in 2013 and 2014, as well as a top-three finish in the LMP2 class at Le Mans in 2014 – will be shared by three newcomers to the Alpine fold, namely Frenchman Nicolas Lapierre, the USA’s Gustavo Menezes and Monegasque Stéphane Richelmi. Both Alpine drivers and cars will be treated fairly, whatever will be the best performant crew. And may the best Alpine wins! Being able to run two top-flight crews will allow Signatech-Alpine to step up its ambitions for its second season in endurance racing’s premier series. After winning last year’s 6 Hours of Shanghai and coming fourth in the 2015 FIA WEC (LMP2), the team is looking to continue to make progress with two cars capable of challenging for victory at every round. Tomorrow will see Signatech-Alpine join the rest of the 2016 FIA WEC field for a two-day test ahead of the championship’s opening round, namely the 6 Hours of Silverstone in Great Britain on April 15-17.